Sound Path Recording & Mastering is a service I offer. My reputation for service is at stake and is entirely in my hands. I'm one opinionated son-of-a-gun, as most audio "experts" are! In fact, when I was recruited to Disney Imagineering in 1989, the first thing they told me was "we don't envy you—you have the toughest job in the company." When I asked why they would say that, the reply was, "everybody is an audio expert, and knows their own job too." Now, 20+ years later, it's just as much so as ever, maybe more now that anyone can buy a recording rig at any music store and declare themselves a recording "engineer," even if they can't tell you what "phase" is or have never used a soldering iron. I've been hands-on with audio electronics and loudspeakers, since 1953. It was at the age of six, I built a Fisher FM tuner kit, extracted the audio amplifier out of an old discarded TV set, and hooked it all up to a ten inch loudspeaker whose magnet was a coil of wire that had to be energized through a 15-watt light bulb and a rectifier to provide the magnetic field to oppose the loudspeaker's voice coil currents. I was hooked on what later became the high-fidelity craze of the 1950s. Instead of cars or shortwave radio or chemistry sets, it has always been sound for me. Sound and the details within it became important pretty quickly as you can imagine, and a lifelong quest was launched to obtain better and better sound. By the time I was nine, I was installing record players in neighbors' cars and had built a Scottkit 30-watt per channel stereo amplifier and obtained my first JBL LE8T loudspeaker—even before stereo hit the market in 1957 and had its big market-solidifying push in 1959. From that point on until today, sound has remained important, and along the way music has provided the incentive to pursue ever higher standards for audio quality. Today, I use JBL LSR32 monitors recommended to me by the former head of Delos Classical, John Eargle, driven by a 1000-watt, Bryston 4B SST2 amplifer, with among the lowest noise and distortion available in an audio power amplifier, and rated as one of the finer audiophile—not just pro—amps on the market. The monitor system is tuned by a state of the art computer-driven DSP processor and a Brüel&Kjær calibrated laboratory microphone with the Smaart™ dual channel FFT audio analyzer. Nowhere on Earth, does it get much better than this, and in the special acoustically designed listening room I designed and built with input and guidance from renowned studio designer George Augspurger and the late John Eargle who literally wrote the books on recording and microphones and more, the sound available to me as my working tool and my bread and butter, is second to none anywhere. Suffice to say, I can hear, in here. OK, enough about how much I love really good audio and the pursuit of audio perfection in sound. 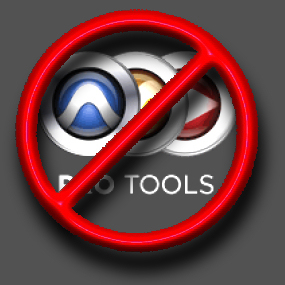 I don't use ProTools, for several reasons. The first reason is the obvious one; it doesn't sound as good as other audio software. The second reason is that I don't believe in software that is hardware-dependent—that confines users to a few pieces of audio hardware that may or may not also sound good. There is no engineering justification for a software company to stubbornly adhere to that sort of policy, except of course to control marketing, extract huge license fees from willing hardware makers, and prevent users from employing superior or universal hardware. The third and most important reason to me for avoiding ProTools, is that its parent companies Digidesign and Avid, in my opinion, engage in predatory business practices and illegal restraint of trade pursuing a monopoly in production software, to the detriment of art and music, worldwide. The fourth reason I don't use ProTools is that it's ponderously slow and inefficient. I can do ten times the amount of work with my software than a ProTools expert can do given the same tasks, whether mastering, or mixing a full-on 5.1 surround 90-minute documentary film. The fifth reason I don't use ProTools is that it's outrageously expensive. In my opinion it's a rip-off carefully and cynically designed to extract the most money from users, and to create the most billable hours in the studio for typical tasks. Just to approximately equal the tools and plug-ins that came native in my software for $349, a comparable ProTools rig would cost well over $15,000 and its updates don't work on the old computer or operating system, so updating those costs thousands more. The sixth and "straw that breaks the camel's back" reason I don't use ProTools, is that it has already cost me tens of thousands of dollars when clients brought ProTools sessions on hard drives that I can't read on my ProTools system because it isn't the latest update—which would cost me another $20 grand just to read the files—or because some rude idiot "engineer" configured his ProTools session full of hidden switches or mutes or busses or 11 tracks on an acoustic trio jazz drum kit but no audible voice, piano or bass. And the last reason I don't use ProTools is that ProTools has created thousands of slob audio practitioners who don't label their tracks, don't comp tracks, don't store sub mixes or stems and don't do one damn thing that used to constitute studio professionalism and courtesy among audio engineers. If recorded tracks are to be transportable at all, they should all start at zero time or be labeled with their start times. Anything else is unprofessional. If Michael Jackson himself rose from the dead and walked in the door with a ProTools hard drive, containing the typical hundreds of file chunks in recording sessions labeled "audio223," "audio 224," "audio225," etc., I'd turn him away and ask him to make his engineer label and time the list of audio chunks he so thoughtlessly dumped on someone else to be their problem. The lack of engineering courtesy and methods among Protools users is also a serious threat to the world's musical heritage. Future archivists will be at a loss to try to reconstruct recording sessions from thousands of chunks of un-named audio files left by lazy slob recordists, which do not line up or make any sense in other DAWs, and might require years of sorting, parsing and positioning to find whole takes or to comp reasonable music tracks that have any chance of reflecting the original artistic intention. Now, if you happen to think ProTools' status as an "industry standard" justifies its turgid, fetid disgustingness, you're certainly welcome to that opinion. Just be aware that your audio is not as good as it could have been and that you are being separated from your money several times over what it would have cost you recording or mastering at Sound Path.